Basketball is one of the most popular sports in the world. The game has the most fans and is one of the most widely viewed sports in the world. Today, you can shop for the best in-ground basketball hoop as there are many hoops available in the market right now. This guide will help you pick the ideal best outdoor basketball hoop that will suit your needs and requirements. In-ground basketball hoops are the best choice for those who have a flat driveway and have plans to stay in their current residence for a long time. More often than not, in-ground basketball systems tend to offer better stability as compared to their portable counterparts. It’s safer to play and there is no need to worry about it when it comes to slam dunking. These hoops can produce more consistent and accurate bounce off the backboard and rim. They are also designed for people who love to practice their basketball playing skills. It allows a player to distribute his own talent. In-ground basketball hoops can be easily installed near driveways, backyards, around the garden or grounds where you play on a daily basis. People of all ages can enjoy a great game by installing the systems in the right places. We have collected the best in-ground basketball goals available in the market. You can read the reviews down bellow to help you pick the right basketball hoop. Silverback SB54CS is a unique basketball hoop that will let you enjoy practicing all kinds of different basketball moves right from the amenity of your own courtyard or driveway. This two-piece pile has a Dupont powder coated finish in order to protect it from the harsh elements and can also be adjusted between 7.5 to 10 feet in height by using the steel actuator in order to have accurate and easy adjustments. Its one of the best adjustbale basketball hoop in stores. The system contains a tempered glass backboard 60 x 33 inches and has a 8mm thick aluminium frame. The pole pad is soft and is made from foam in case players come in contact with it (only provided with SB60). The backboard is made from tempered glass, which also comes with the breakaway rim which can withstand any extreme play, similar to professional rims. This hoops features a great anchor bolt mounting that provides high stability. 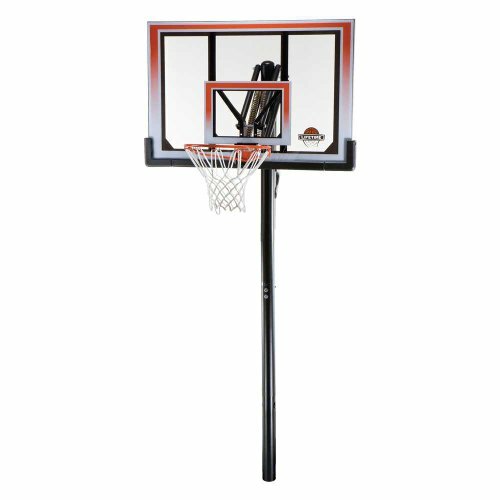 It comes with 4×4 inch two-piece steel pole that provide massive strength that support the weight of the backboard. This means that it will have less vibration than other portable basketball systems. The pole pad (SB60) is the one in charge of absorbing your inertia as this will let you down for you to snap back and pick up a good rebound. The pad is soft and is made from foam in case players come in contact with it. If your budget allows it, consider buying the 60 inch version without any hesitation. Silverback SB54iG is a very good choice for those who take basketball very seriously and have the intention to be a pro basketball player. If you want more quality, the SB54iG hoop from Silverback is a fantastic product that you might want to check out. You will know that this basketball goal is of professional style just by looking at it. It has 54 inch backboard that is made from tempered glass, which happens to be the best material for backboard being used today. It is also the backboard that gives the hoop a sturdy and reliable feel. It comes up with an all steel actuator and because of this the height can be easily adjusted from 7.5 to 10 feet. The hoop features a 4 x 4 steel pole with DuPont powder coating for weather proofing the pole to ward off dust and making it more durable. Rugged steel is used through the system which provides incredible strength. The steel pole provides less vibration than other portable basketball systems. Its in-ground mounting also includes an extra DuPont coating for powerful protection. Another amazing feature is the heavy-duty padding wrapped around the pole. This improves safety for those players who might hit the pole while playing. The hoop provides a 2 foot overhang from the backboard to the pole, this allows the player to play beneath it. Also included with this goal is a great breakaway rim. The rim uses spring to keep up with dunking and hard play. Players can practice their skills in dunking because the rim bends based on the applied pressure and goes back to its original position like an elastic material. Spalding 88454G, an in-ground basketball hoop with 54 inches, is a durable, reliable and sturdy system that boasts of a professional feel and look. Its square glass backboard of 54 inches has been lined with steel frame and contains aluminium trim along with ¼ thick tempered glass to make sure that you can play often and play hard even under extreme natural calamities. The board of this hoop features yoke arms that gives more balance and stability. This system is backed with the U-lift feature from Spalding that makes the rim adjustable in height from 7.5 to 10 feet. This means that you can use and adjust it according to your specific needs. The backboard has an offset which is 2 feet from the pole. This will allow player to work on their skills just below the hoop. It has a ground sleeve anchor system that allows the structure to be installed very easily. The hoop contains two piece, 4’’ square steel pole which provides maximum stability and adds strength to play outdoors. 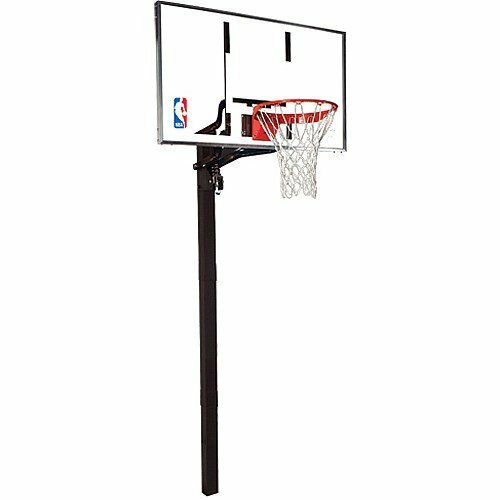 The official NBA logo is featured on the backboard of this adjustable hoop. With the Spalding 88454G in-ground system, you can be sure that you will be getting the most out of your game in the many years to come. This particular basketball system is no doubt a solid choice for the serious players who like to hone their skills. Its net has been made in such a way that it will be able to stand all types of weather. It comes with a square-shaped pole and is also powder coated so that rust will be prevented. However, a notable downside of this hoop is that its manual is not user-friendly as it can be vague sometimes, according to those who already bought the product. Installing this goal can also be difficult without assistance. But overall it is a durable and reliable product that provides the players a great experience of playing basketball. One of the best in-ground basketball hoop under $500 is the Lifetime 71525. This goal is suitable for all ages who like to play basketball. Spare your jump shot for this incredible quality value basketball hoop system. This in-ground hoop is designed for high intensive play. The backboard of this hoop has a size of 54 inch that is steel-framed. It can take on aggressive play, because it’s made of Makrolon polycarbonate. Makrolon is very powerful when compared to the traditional backboard material. In addition to this, the system is also coated with a UV that prevents it from yellowing. The pole features a power lift height adjustable mechanism that adjust the backboard from 7.5 to 10 feet high with just one hand. It doesn’t require you to have any tools to adjust the height, as a result, the user can just use the handle to lower or lift the backboard. This goal is perfect for dunking as it uses a double-compression rim, which is made from solid-steel that can take on jumphots. The double-compression rim springs provide a great spring-back action, especially when dunking.The Slam-it Pro rim has a nylon net attached to it that can be used in any season. The Lifetime 71525 is easy to install and takes only 72 hours (time took by cement to get rigid) to get ready for intense play. This is one of the least expensive basketball hoop you can get on the market. The Lifetime 71799 is considered as the best in-ground basketball hoop by many buyers in its price range. This product has a 50 inch steel-framed shatterproof backboard. The backboard is made of sturdy Makrolon polycarbonate, which is 30 times stronger than other backboards that are made of acrylic, making the board almost unbreakable. The shatter proof backboard gives you the look and feel of a real professional game. The hoop contains a spring back rim and features a heavy-duty styled rim along with a weather nylon net. The rim comes with double compression springs so that players can practice dunks frequently and provides an opportunity to the young players to build up skills. One of the biggest benefits of getting the Lifetime 71799 is its price as this is said to be a very affordable one as far as in ground basketball hoops are concerned. There are also additional bracing being offered behind its backboard in order to make this basketball system even more stable. It also has a simple action grip pole that makes it easy to adjust the height from 7-1/2 to 10 feet in 6-inch increments just with one hand. Even after having these good features, its polycarbonate backboard doesn’t offer the predicted responsiveness. The backboard also doesn’t quite provide better function that it was supposed to perform than the acrylic as well as tempered glass boards. The system comes with a five-year warranty. In total, it creates a good residential basketball environment. Lifetime 90020 is a great option if you’re on a low-budget and still want a high-quality hoop. 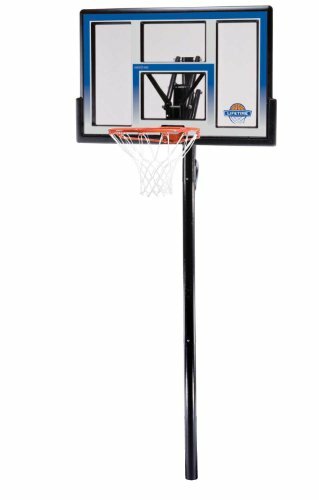 Instead of the aforementioned in-ground basketball hoops, Lifetime 90020 is still affordable if you’re looking for a good hoop, but don’t want to spend all of your savings. Starting from the top at the backboard, its 48-inch Shatterproof Fusion board certainly won’t break if you throw some rough shots at it. It has a pro glass look, fade resistant graphics and Makralon playing surface. Makralon is a thermoplastic sheet material, especially designed to resist impact. The backboard is equipped with an action grip adjustment mechanism that is easy to handle with a single hand. Users can adjust the height of the backboard from 7.5 to 10ft prime in six-inch increments. Lifetime 90020 is ideal for outdoor and indoor use, because of the 18-inch Slam-It Rim. This rim can take all kind of different slams, since the ring is made of 5/8-inch solid steel, 1/2-inch steel braces and double compression springs. The black steel pole is coated with rust-resistant powder, which also contributes to its outdoor use. With the features and qualities of Lifetime 90020, there is no doubt that it is one of the highly recommended, especially for those who are on a tight budget and want to own an in-ground basketball hoop that will give them a great experience. Spalding ‘888’ series is one of the most stable and durable in-ground basketball hoop. This hoop is the best choice for those who have a bigger budget and wish to have a better in-ground basketball hoop. The ‘888’ series is one of the best selling hoops. The backboard is available in three sizes: 54”, 60” and 72”. The backboard is made of steel framed 3/8” tempered glass, which gives superior rebound. Because Spalding ‘888’ series in-ground basketball is the official system of the NBA. This assures you it can handle any type of rough play. The hoop is adjustable between 7 and 10 feet with the help of the U-turn pro lift system. This system enables you to adjust the the board at the right height, for you and your kids. The height adjusting system is fairly easy to operate. Its lift handle is removable. The system is equipped with the breakaway rim. The rim has heavy-duty wraparound support for optimal strength and durability. Because of its 3-4 foot offset from the pole, you can also play underneath the rim. 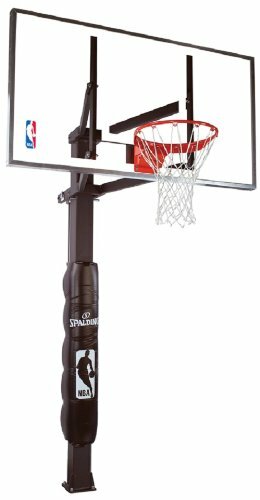 The pole of the Spalding ‘888’ series in-ground basketball system is a one piece made of steel and is known for its sturdiness. Most buyers say there is little to no vibration, even if you dunk and play a quite rough game. The system is equipped with a heavy-duty pole pad, so you will be able to play safely. The Spalding ‘888’ series also comes with a lifetime warranty. According to reviewers who bought this system there is one minor disadvantage: its backboard is heavy. You’ll need at least three adults to install the hoop. The instructions say you need ladders to instal the backboard, but it is way easier to from the rear bed of a pickup truck. Other than that: it is a great and stable system that will last for years. There are more premium options like the Lifetime Mammoth. This hoops can be compared to the Spalding. Before you make your final decision, there are a few things you should consider. Of course the price is one of the most important things in your decision. On the other hand, you might want to look away from the price and you’ll still be happy afterwards for many years to come. When you’re choosing the best in-ground basketball system, you should consider about how you’ll install the hoop. Is a professional required for installing it or is it easily installed by yourself? If a professional is needed, you’ll have to spend some extra money for the installation, which is about 450 dollars on average. The basketball hoops used in NBA have a height of 10ft, same as most other professional basketball games. It’s also great if the height is adjustable if you have any kids. They would love to play basketball as it’s healthy to do some sports. Backboard sizes variate between 44” and 72”. The professional NBA games are played with 72”, but that is not always the best option for playing at home. A backboard which has that size simply doesn’t fit in every backyard or driveway. That’s why a 60” backboard, such as the Silverback, is often a better option. If you would like a smaller backboard, 54” is also a good option for your driveway. The even smaller sizes are more fit for children, who are less intimidated by a 44” or 48” board. Basketball backboards can be created with different types of material. Most backboards are made of glass, acrylic or polycarbonate. Of course you want a goal that has a high rebound response. This all depends on the type and thickness of the material. Glass backboards are definitely the winner compared to others. It provides the best rebound. It’s the same material you see on professional backboards. They can only be found on high-end basketball goals like seen in the competitive NBA. Acrylic material is light but not as durable as polycarbonate. It’s also translucent when you look at it. The material provides medium rebound compared to other materials. Over time it will have scratches. Polycarbonate is really powerful compared to acrylic. It’s perfect for mid-range basketball hoops. The main difference is its durability, this is important for boards that are thin. Polycarbonate wins from Acrylic as seen in this video. So What’s the Best Outdoor Basketball Hoop? This was our list on picking the best in-ground basketball hoop. I hope this guide will help you pick the right goal. If you still have some doubts, pick the Silverback SB-60. You can’t find a better basketball goal within its price range, especially since it’s made from glass. One final note, before digging a hole, check if the spot where you want to place the hoop doesn’t contain any electric cables. I have got the Lifetime 71525 now for two weeks. Can confirm that it is indeed easy to install. What is even better about it is the adjustability of it. It is more than good enough for a “budget” hoop and we will be using this for many more years. Thanks for this guide!